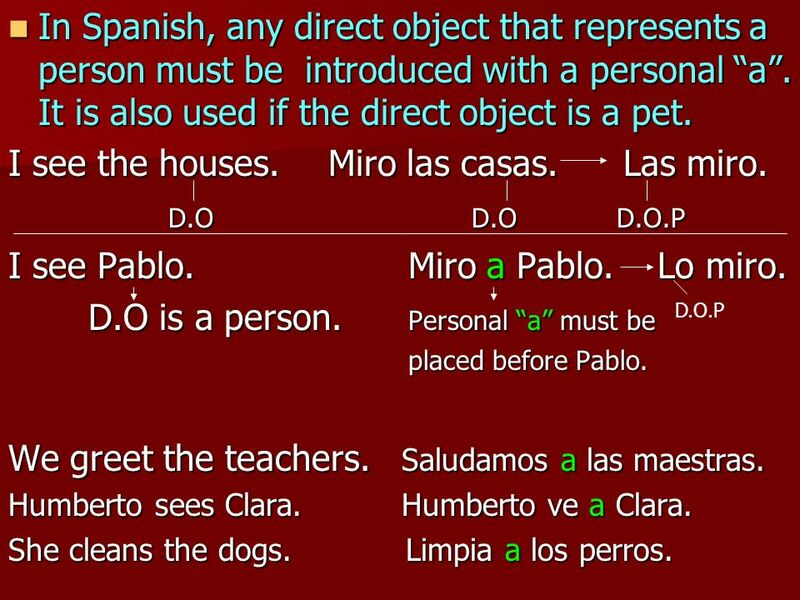 2 The direct object receives the action of the verb. She buys a book. We see the children. 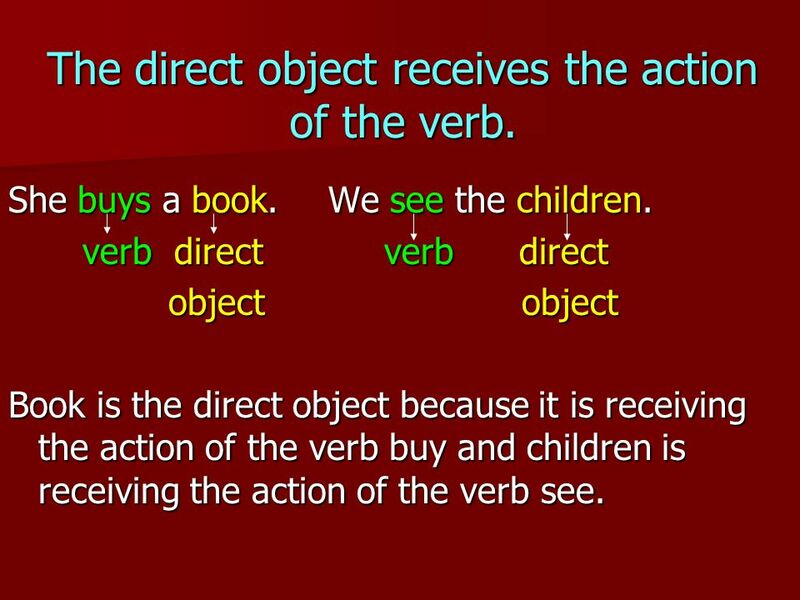 verb direct verb direct object	object Book is the direct object because it is receiving the action of the verb buy and children is receiving the action of the verb see. 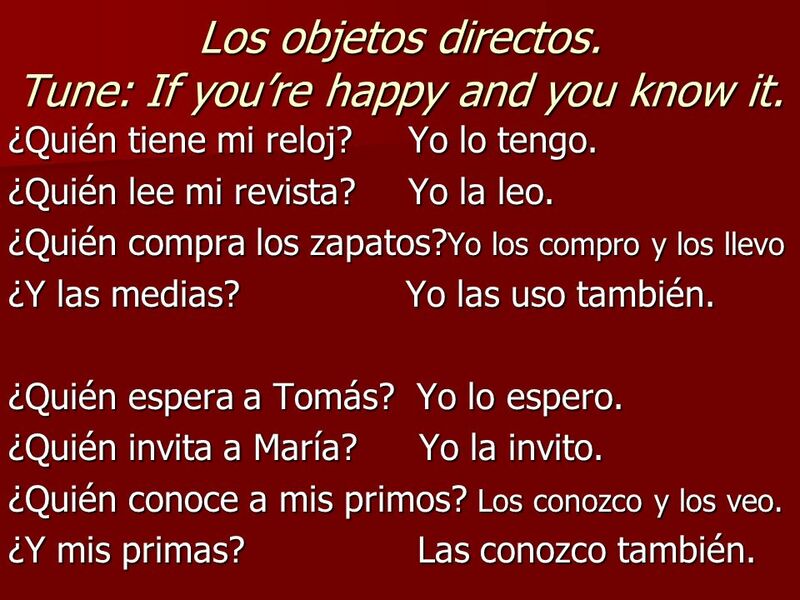 3 Direct object pronouns replace the direct object. She buys a book She buys it. We see the children. We see them. 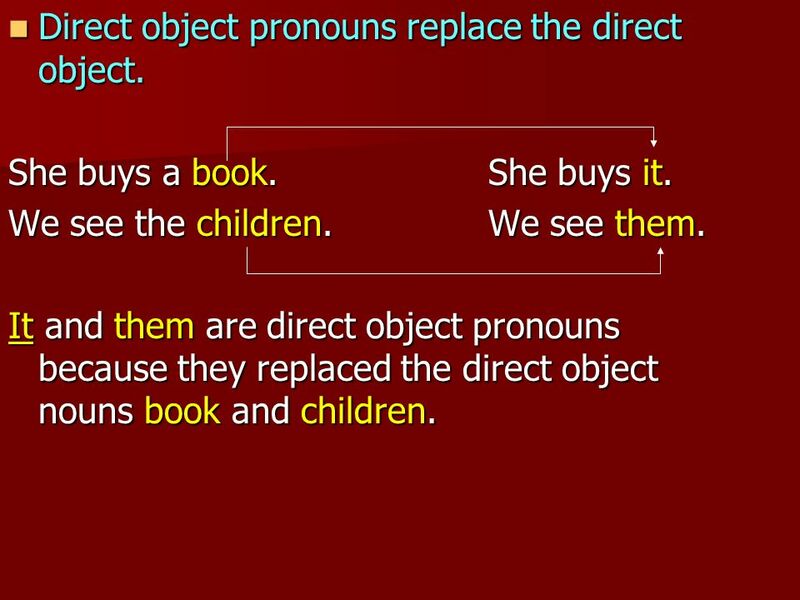 It and them are direct object pronouns because they replaced the direct object nouns book and children. 4 Ejercicios. Change the direct object to “it” or “them”. Ex. Raul and Jose clean the house. They clean it. Hugo sands the door. I buy the pencils. Gabriel and I remember the answers. 4. Yolanda sells a dress. 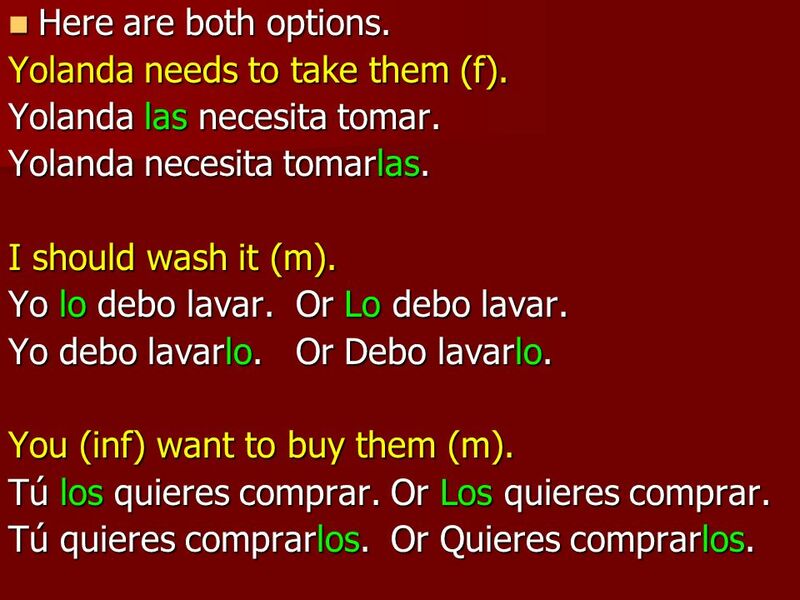 it lo (m) them	los (m) la (f) las (f) Direct object pronouns are placed before the verb in affirmative sentences. I buy an apple. Yo compro una manzana. I buy it. La compro. La because manzana is fem. 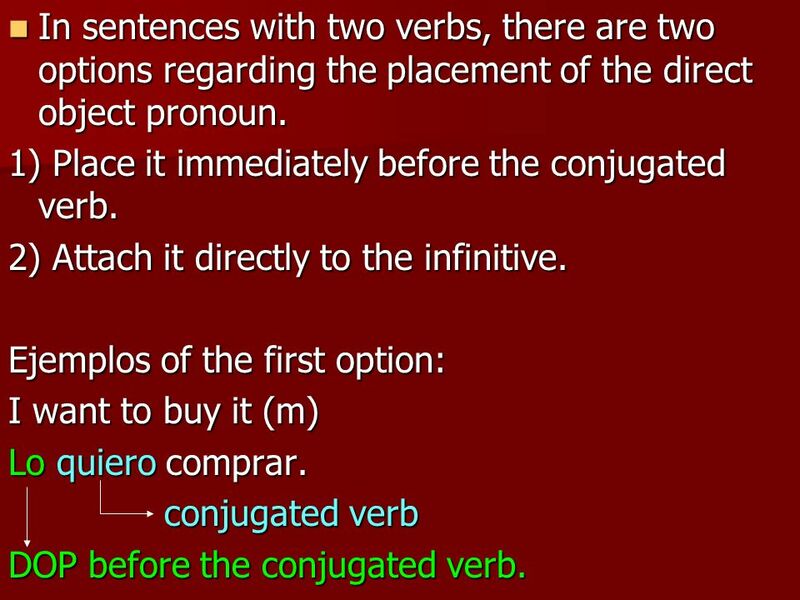 It also has to be placed before the verb compro. 6 Ejercicios. They sell skirts. Ellas venden faldas. 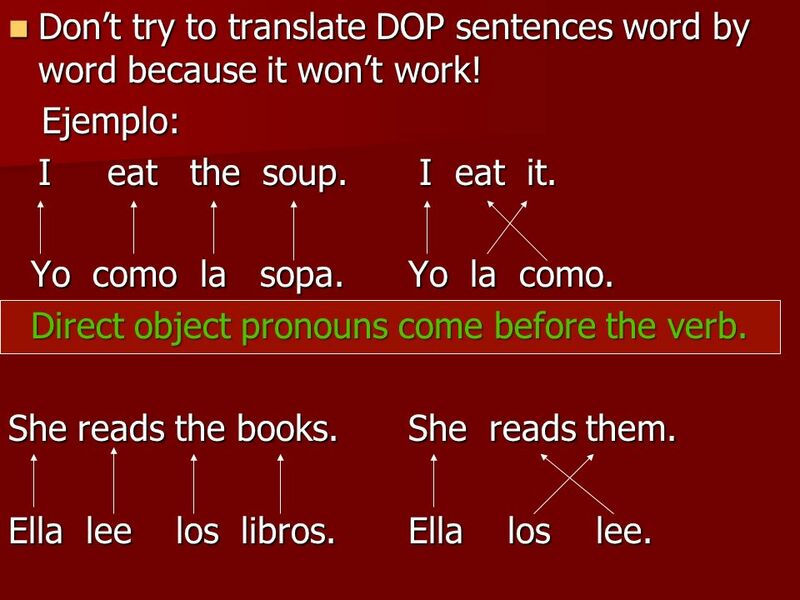 8 Don’t try to translate DOP sentences word by word because it won’t work! Ejemplo: I eat the soup. I eat it. Yo como la sopa. Yo la como. 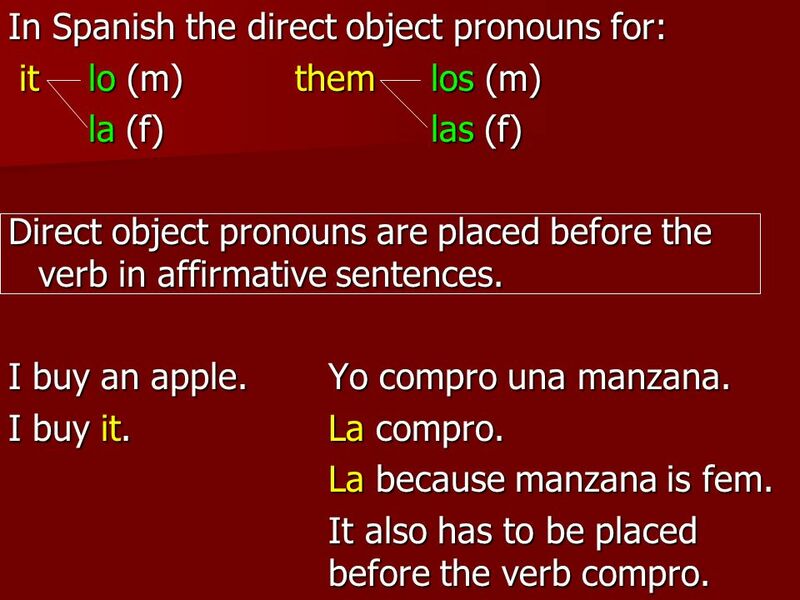 Direct object pronouns come before the verb. She reads the books. She reads them. Ella lee los libros. Ella los lee. 9 Los objetos directos. Tune: If you’re happy and you know it. ¿Quién tiene mi reloj? Yo lo tengo. ¿Quién lee mi revista? Yo la leo. ¿Quién compra los zapatos?Yo los compro y los llevo ¿Y las medias? Yo las uso también. ¿Quién espera a Tomás? Yo lo espero. ¿Quién invita a María? Yo la invito. ¿Quién conoce a mis primos? Los conozco y los veo. ¿Y mis primas? Las conozco también. 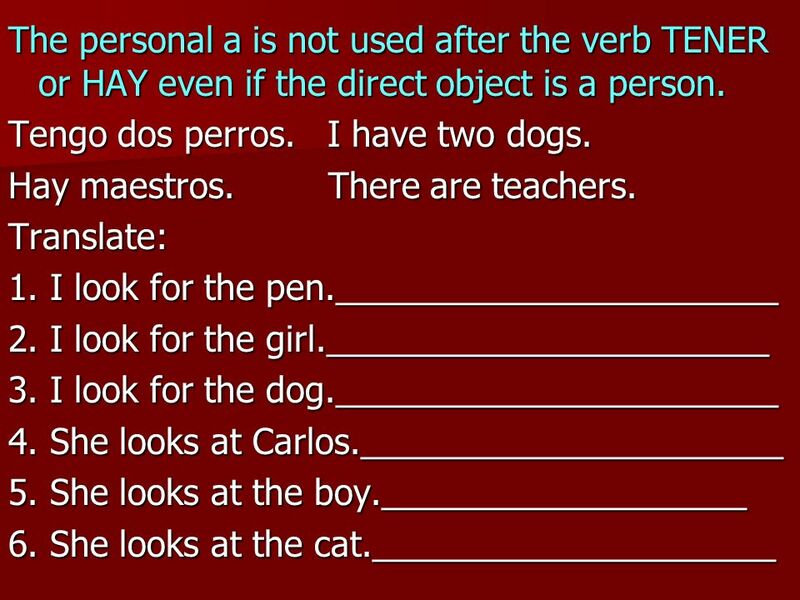 11 The personal a is not used after the verb TENER or HAY even if the direct object is a person. 12 Ex. He sees me Él me ve. 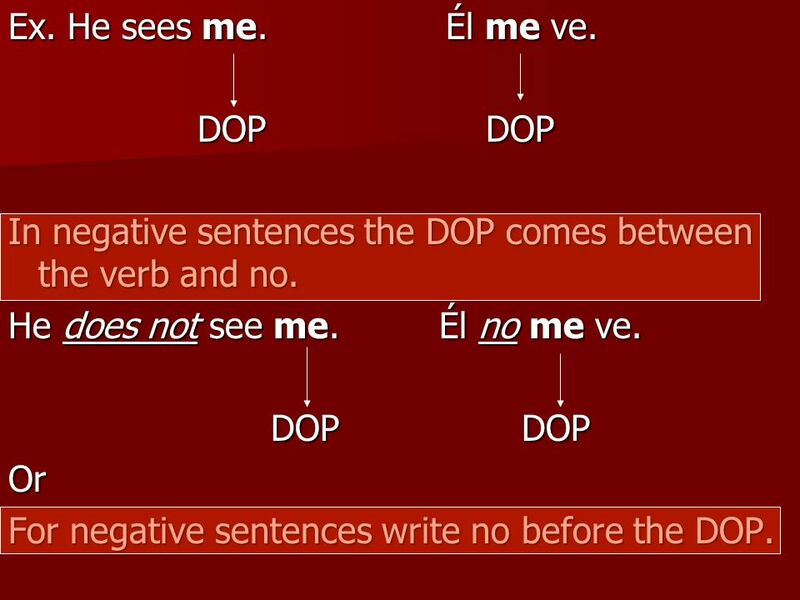 DOP DOP In negative sentences the DOP comes between the verb and no. He does not see me Él no me ve. DOP	DOP Or For negative sentences write no before the DOP. 15 Sentences with two verbs. 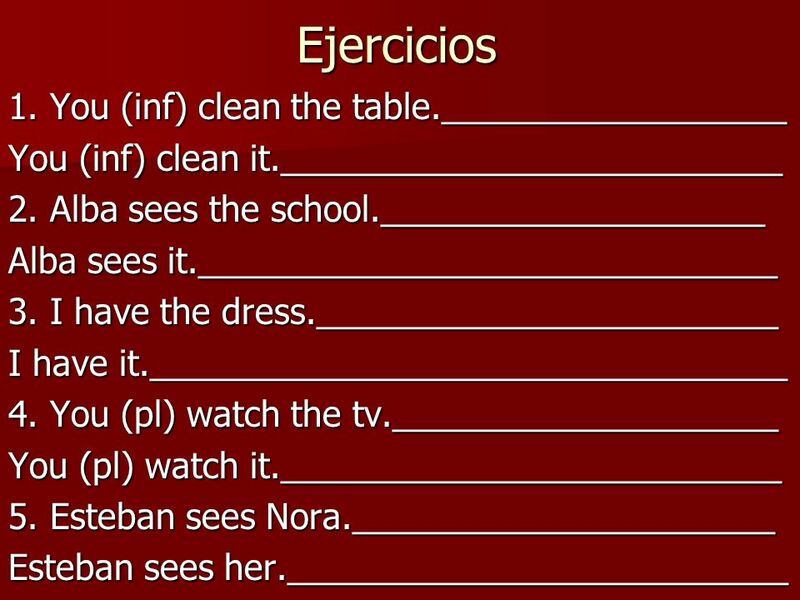 16 In sentences with two verbs, there are two options regarding the placement of the direct object pronoun. 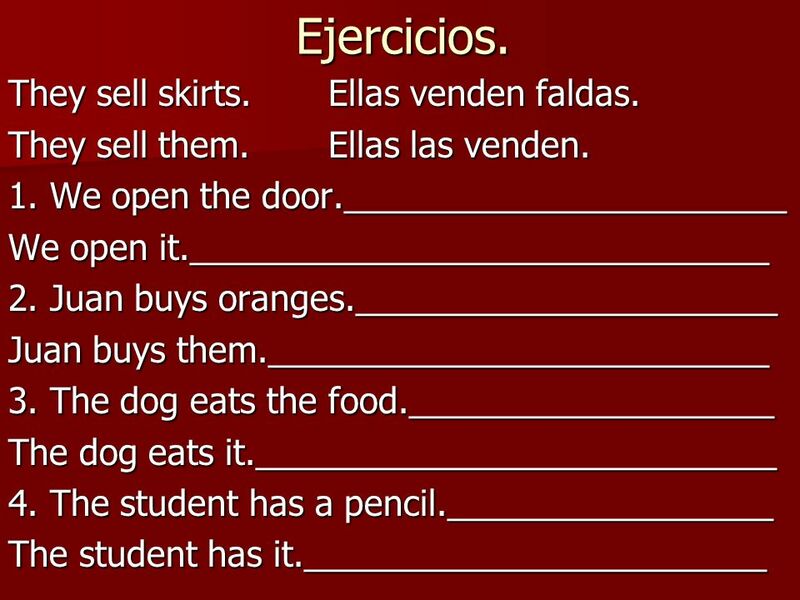 1) Place it immediately before the conjugated verb. 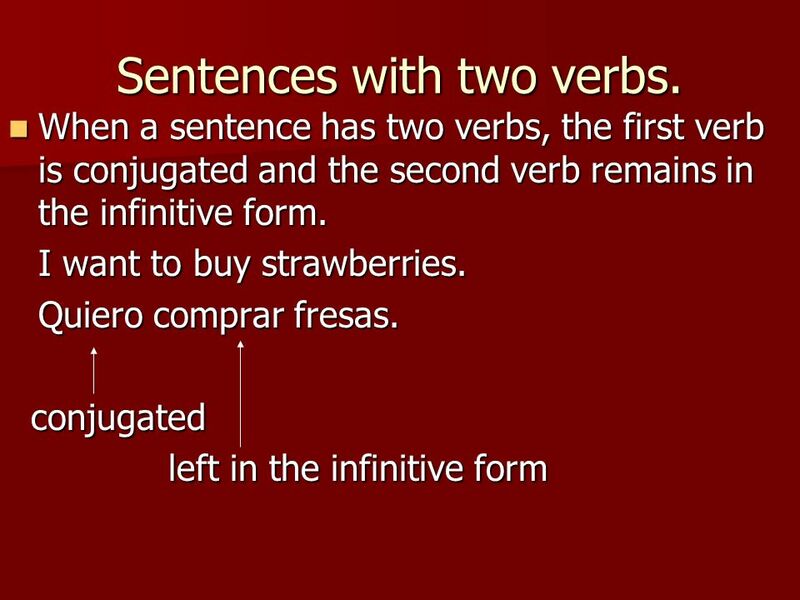 2) Attach it directly to the infinitive. 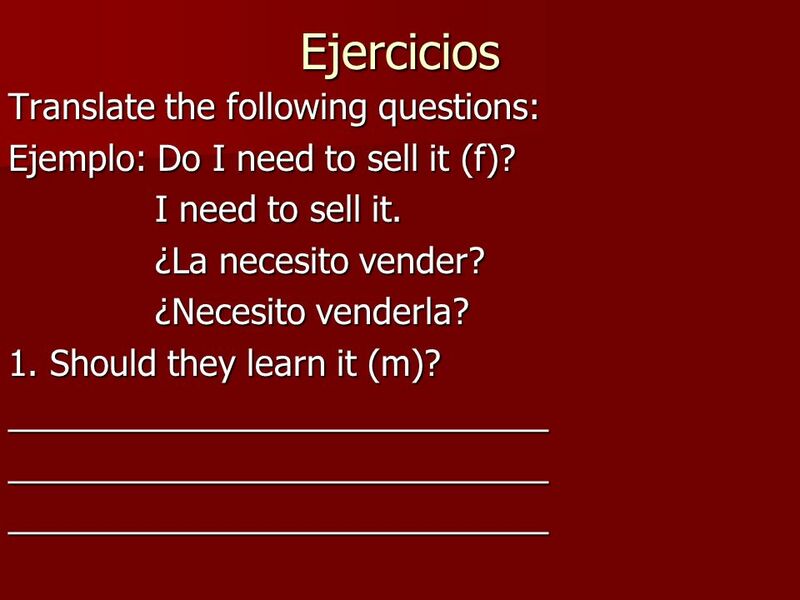 Ejemplos of the first option: I want to buy it (m) Lo quiero comprar. 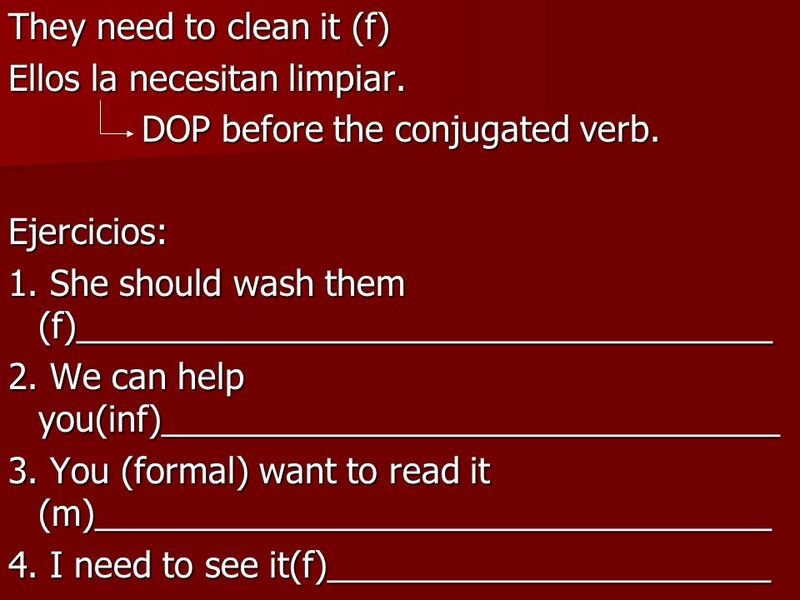 conjugated verb DOP before the conjugated verb. I want to buy it (m) Quiero comprarlo. 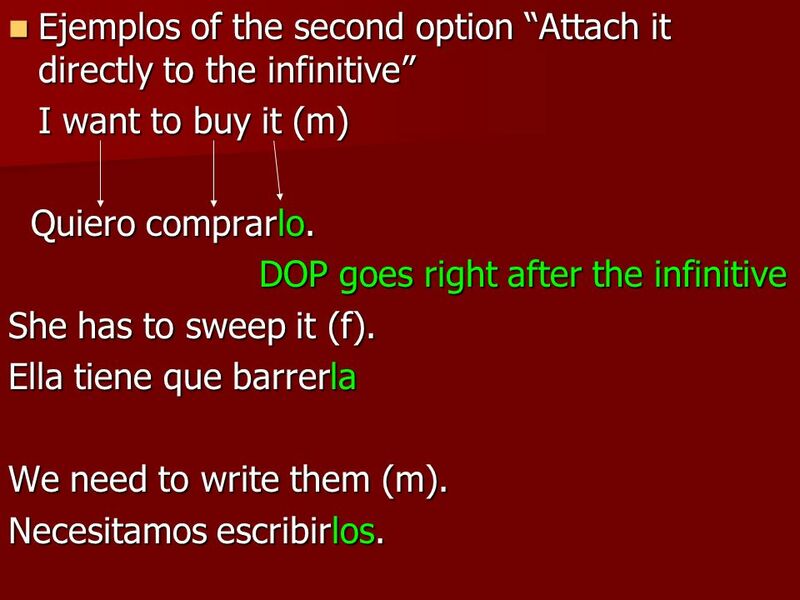 DOP goes right after the infinitive She has to sweep it (f). Ella tiene que barrerla We need to write them (m). Necesitamos escribirlos. 20 Here are both options. Yolanda needs to take them (f). Yolanda las necesita tomar. Yolanda necesita tomarlas. I should wash it (m). Yo lo debo lavar. Or Lo debo lavar. Yo debo lavarlo. Or Debo lavarlo. 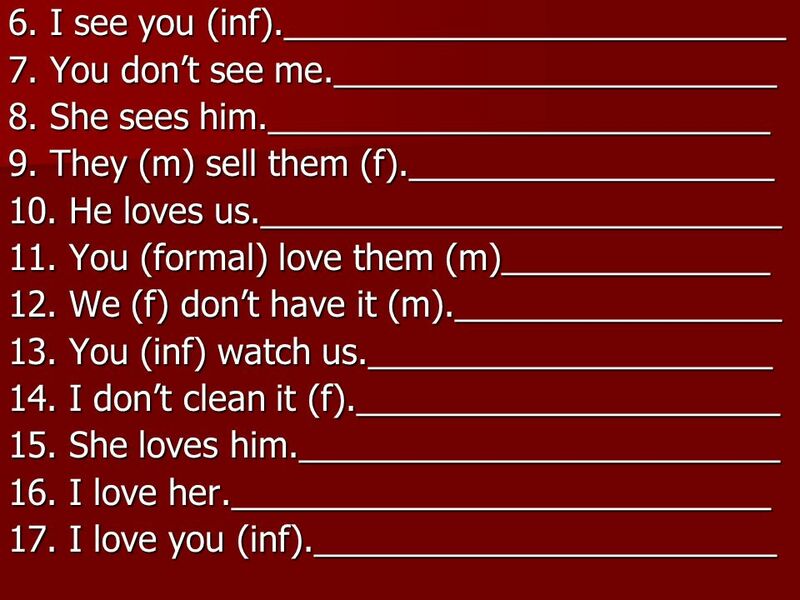 You (inf) want to buy them (m). Tú los quieres comprar. Or Los quieres comprar. Tú quieres comprarlos. Or Quieres comprarlos. 21 To make questions. 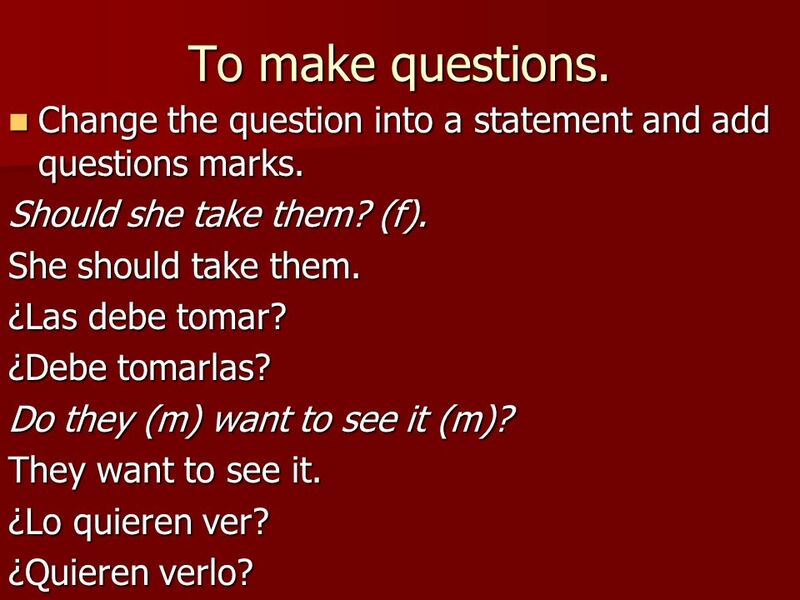 Change the question into a statement and add questions marks. Should she take them? (f). She should take them. ¿Las debe tomar? ¿Debe tomarlas? Do they (m) want to see it (m)? They want to see it. ¿Lo quieren ver? ¿Quieren verlo? 23 1. Does he have to clean them (m)? ______________________________________ 2. Do we need to see it (f)? 3. 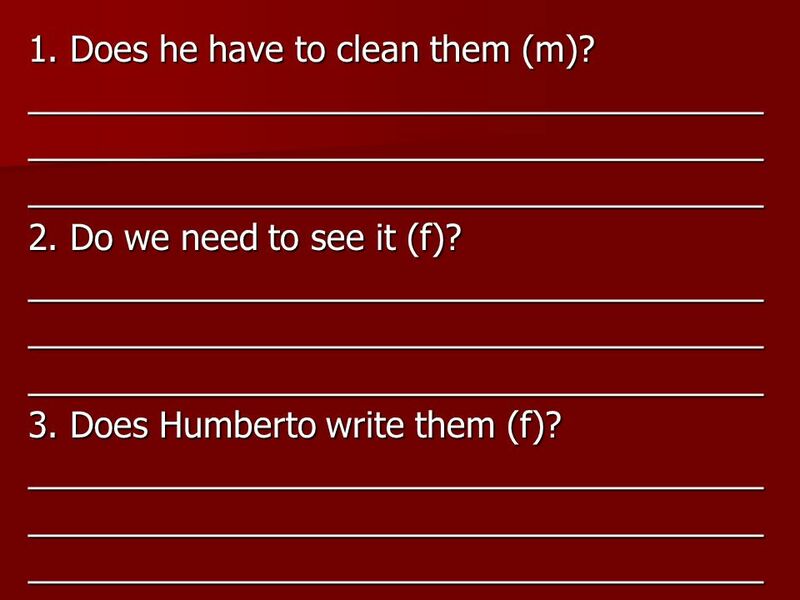 Does Humberto write them (f)? 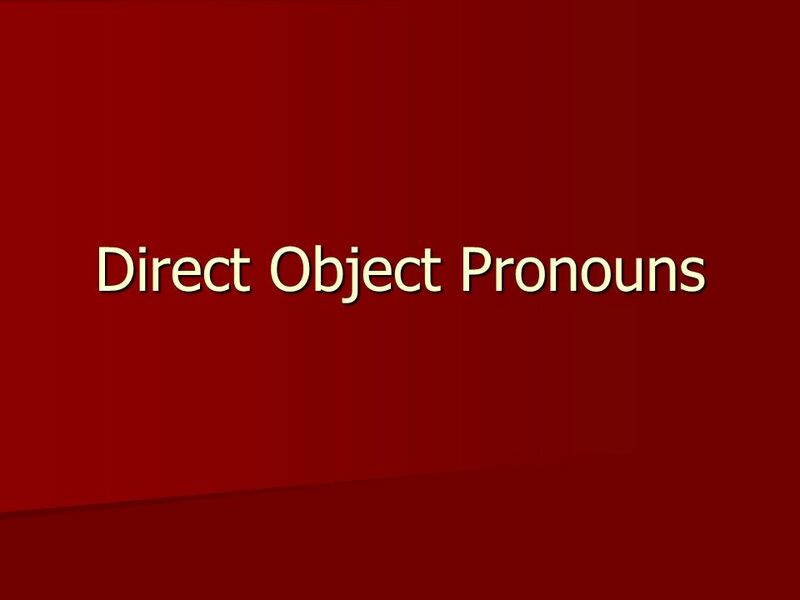 Download ppt "Direct Object Pronouns"
OBJETIVO To learn how to use direct object pronouns (DOPs) correctly. 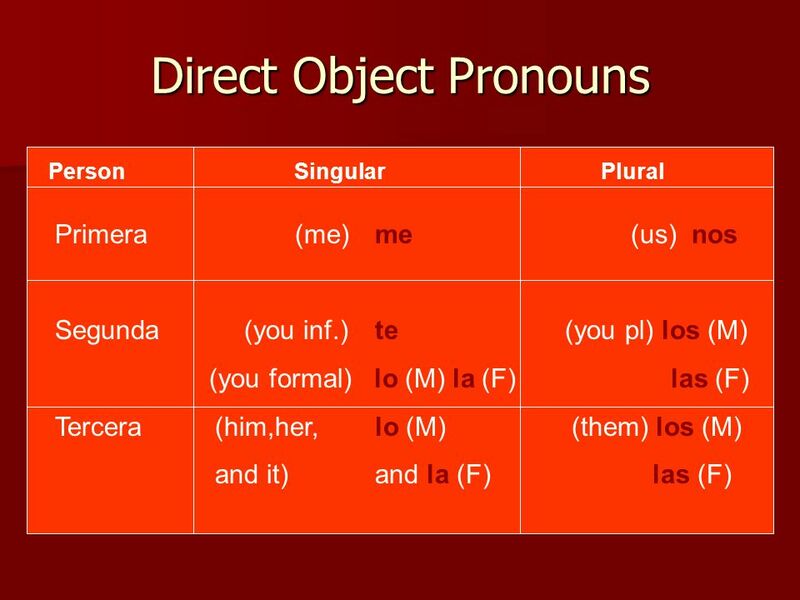 Direct Object Pronouns. The object that directly receives the action of the verb is called the direct object. Bill hit the ball. "Ball" receives the action. 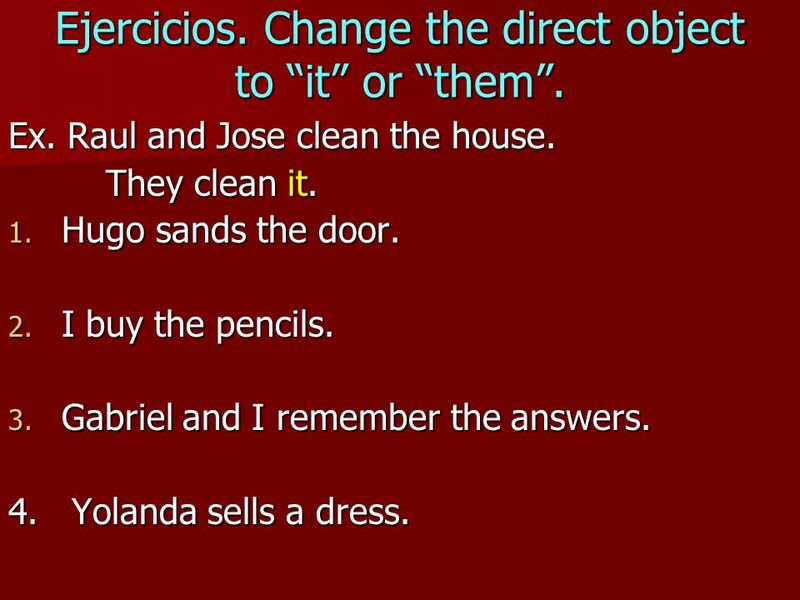 Unidad 1-1 Los pronombres a pronoun replaces a noun.